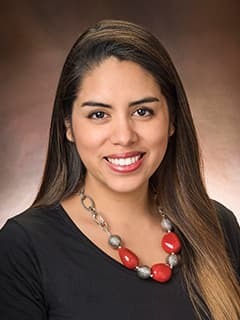 Diana Montoya-Williams, MD, is a neonatologist with the Division of Neonatology at Children's Hospital of Philadelphia. Montoya-Williams D, Quinlan J, Clukay C, Rodney NC, Kertes DA, Mulligan CJ: Associations between maternal prenatal stress, methylation changes in IGF1 and IGF2, and birth weight. J Dev Orig Health Dis 11: 1-8, Oct 2017 Notes: doi: 10.1017/S2040174417000800. Montoya-Williams D, Mowitz M: Cholestasis and hepatic iron deposition in an infant with complex glycerol kinase deficiency. Pediatrics 140(1): e20161479, Jul 2017 Notes: doi: 10.1542/peds.2016-1479. Montoya-Williams D, Jayaramaraju P, Hiers P, Butler A: Prolonged rash and fever in a 9 month old girl. Pediatr Rev 38(2): 99-100, Feb 2017 Notes: doi: 10.1542/pir.2015-0030. Montoya-Williams D, Quinlan J, Clukay C, Rodney N, Kertes D, Mulligan, C: Associations between Maternal Prenatal Stress, Birth Weight and Methylation Changes in IGF-1 and IGF-2. Poster presentation, Pediatric Academic Societies, San Francisco, CA May 2017. Williams B, Alvarado C, Montoya-Williams D, Matthias R, Blakemore L: Buckling down on torus fractures: assessing current treatment practices in the management of pediatric buckle fractures of the wrist. Poster presentation, Institute for Child Health Policy Research Day, Gainesville, FL Apr 2017. Montoya-Williams D, Quinlan J, Clukay C, Rodney N, Kertes D, Mulligan, C: Associations between Maternal Prenatal Stress, Birth Weight and Methylation Changes in IGF-1 and IGF-2. Poster presentation, Institute for Child Health Policy Research Day, Gainesville, FL Apr 2017. Montoya-Williams D, Quinlan J, Cluka, C, Rodne, N, Kertes D, Mulliga, C: Associations between Maternal Prenatal Stress, Birth Weight and Methylation Changes in IGF-1 and IGF-2. Poster presentation, Consortium of Universities for Global Health, Washington, DC Apr 2017. Delcher C, Wang Y, Mowitz M, Gurka K, Montoya-Williams D, Gurka MJ, Shenkman E: The 30-Day Readmission Rate for Infants born with Diagnosed Neonatal Abstinence Syndrome (NAS) in the United States. Poster presentation, 2014 Institute for Child Health Policy Research Day, Gainesville, FL Apr 2017. Montoya-Williams D, Ortega A, Keith B: Education through empowerment: a novel global health track model for residency programs. Poster presentation, Advances in Medical Education, Jacksonville, FL June 2016. Montoya-Williams D, Mowitz M: Cholestasis and hepatic iron deposition in an infant with complex glycerol kinase deficiency. Poster presentation, Southeastern Association of Neonatologists, Naples, FL May 2016. Montoya-Williams D, Ortega A, Keith B: Education through empowerment: a novel global health track model for residency programs. Poster presentation, Consortium of Universities for Global Health, San Francisco, CA Apr 2016. Montoya-Williams D, Vijayan V: Attitudes and perceptions of pregnant adolescents towards Tdap vaccination. Poster presentation, Pediatric Academic Societies: Advocacy Special Interest Group Meeting, San Diego, CA Apr 2015. Montoya-Williams D, Vijayan V: Attitudes and perceptions of pregnant adolescents towards Tdap vaccination. Poster presentation, Neonatology 2015: Patient Care, Quality Improvement, Safety & the Law, San Francisco, CA Mar 2015. Montoya-Williams D, Vijayan V: Improving perinatal Tdap vaccine administration rates at Shands Hospital. Poster presentation, Patient Safety and Quality week at UF Health Shands Hospital, Gainesville, FL Mar 2015. Montoya-Williams D. "Caring for the Immigrant Patient". Global Health Equity Seminar, University of Florida College of Medicine . September 2017. Montoya-Williams D. "Association of maternal prenatal stress, methylation changes in IGF-1 and IGF- 2, and birth weight in mother-newborn dyads". 2017 Talbert Lectureship and Symposium, University of Florida. Gainesville, FL. 2007, Highest honors in field of History of Science, Harvard University. For senior thesis: "From Field to Clinic: Anthropological Representations of Susto and the Treatment of Latino Patients in Contemporary America"
2006, Harvard Foundation Award, Harvard College. For "displaying a sustained effort to improving racial harmony at Harvard College"